See how we can make your dreams of the ultimate media room come true. In many homes, the family room serves as the media room. The focal point in many family rooms is a fireplace in the middle of a wall with either blank wall space or cabinets flanking the fireplace. Placing a flat screen TV over the fireplace mantle is a very popular design option. This can be great, if (and this is a big if) you can position seats far enough away so you don’t feel like you’re looking at the ceiling to see the TV. When you select your desired screen size, we suggest cutting a cardboard or poster board pattern to match the dimensions and placing it at the proposed location. Sit back in your chair and look at it for a few minutes. Does your viewing position feel comfortable? If it does, that’s great. If not, consider placing your TV lower: either to one side of the fireplace or even on another wall. If you get one thing right make sure to get the best center channel speaker you can afford and position it properly. All the dialogue in a movie comes out of the center channel speaker and if you can’t understand dialogue, you can’t follow the plot! Ideally, your center channel should be located directly above or below the TV. If you decide to place your TV above a mantle, you can put the center channel speaker over it to get the screen a bit lower. Some center channels can be customized to match the width of your TV to create a complementary look. Electronic Integration has a wide selection of center channel speakers for every design consideration. Surround speakers can be positioned on side walls or the rear wall. In media rooms, location usually depends on architectural elements of the room such as windows and doorways. In an existing home, wiring for wall-mounted speakers is typically much less time consuming and invasive than for ceiling speakers. Sketch out your room for us and we can advise you on your best surround speaker options. Speaker possibilities may be dipole, bipole, or directional depending on your room and your seating. In situations where you absolutely have no room for a speaker anywhere other than at the TV, something you may consider is a speaker bar, with multiple speakers in one compact cabinet. If you are creating a media room from scratch or have easy ceiling access, there are many ceiling mount speakers that can be angled toward the listening position. If properly planned, these can be very inconspicuous while not sacrificing audio quality. 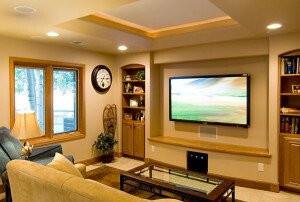 A typical family room usually has adequate acoustic properties. Window treatments are a plus, as are plants, furniture, rugs, bookcases full of books, wall hangings, or anything else that breaks up reflected sound. An example of a challenging room is one with very high ceilings and lots of sheetrock walls that reflect sound quite a bit, making it very difficult to understand movie dialogue tracks. When Electronic Integration calibrates a room like this, we make adjustments to provide the best possible dialogue reproduction. If you deal with this kind of room, consider adding enough furniture and fabric to absorb sound reflections and keeping the center channel height close to your seated ear level. In many rooms, existing cabinets can be adapted to house components. However, it’s critical for your components’ life expectancy that they have adequate ventilation. Your amplifier or receiver will generate heat. The cable box, satellite box, or video game system will also radiate huge amounts of heat. Drilling holes for passive ventilation is usually not enough, so Electronic Integration typically installs a ventilation fan in the cabinet to exhaust hot air. If you plan to enjoy your media room during the day for more than casual viewing, then consider how sunlight streaming through windows may shine on your TV. Sunlight glare can wash out a picture. It’s very easy to fix this problem with curtains, window treatments, or some impressively quiet and elegant motorized shades. If no one knows how to turn the system on and select his or her options, it’s obvious that enjoyment will drop! A well-planned and programmed remote control makes all of the difference. Reliable system controls are available so you can conceal all your components and perfectly transmit signals to them. Electronic Integration offers a wide range of control options that are dependable and easy to use. Imagine a room with a medium sized flat panel TV for casual daytime viewing. When evening movie time arrives, one simple button push on your remote control causes sleek, motorized blackout shades to descend as your lights dim. Your theater screen quietly lowers from its ceiling hiding place at the same time. The screen is filled with bright, crystal clear images from your hidden projector, as music from the soundtrack envelops you, creating a complete motion picture experience. The Electronic Integration design team can help you create this ultimate media room experience in your home and help make your other home entertainment dreams come true!